On Thursday, 15 November, Color Line and Ulstein Verft marked the construction start-up on the world’s largest plug-in hybrid vessel, Color Hybrid. The hull is placed in the dock hall, and several hundred employees are now busy with the vessel’s completion before hand-over next summer. Color Hybrid is a plug-in hybrid vessel. This means that the vessel will switch to batteries when it reaches the fjord outside Sandefjord. The vessel will be powered by battery through the fjord, without noise or harmful emissions. When moored in Sandefjord, the vessel will be charged by a shore connection. Color Hybrid is a good example of the interaction in the maritime cluster. Color Line chose Ulstein Verft for this newbuilding project. Furthermore, the yard has contracted the subsuppliers to this project, of which about 70% are local. “The determination and the ability to adjust course has been one of the key drivers in the development of the company. 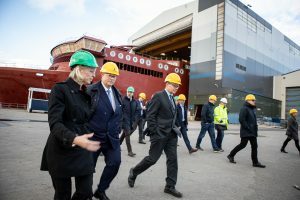 In about half a year, this magnificent hull will be a flagship for the natural environment and for innovation for the Norwegian maritime industry,” said Trond Kleivdal, CEO Color Line at the kick-off at Ulstein Verft. “When Color Line chose Ulstein Verft for the construction of the Color Hybrid, the ripple effect for subcontractors and cooperative partners, both regionally and nationally, is very high. At Ulstein Verft alone, approx. 400-500 people will be involved in this project. Every workplace in the shipbuilding industry generates more than 5 workplaces in the private and public sectors. This creates the firm base for a viable region and provides significant tax revenues for the Norwegian state and municipalities,” stated Gunvor Ulstein, CEO Ulstein Group. Color Hybrid will be servicing Sandefjord-Strömstad from summer 2019. Even before the vessel has been built, she has earned her first award. At the opening ceremony of the Nor-Shipping exhibition in 2017, the ship was appointed the winner of the Next Generation Ship Award. With a focus on innovation, the award honours the most promising design on ships that will be launched in the coming decade. According to the jury, the vessel demonstrates the innovation and ambition that are pushing the maritime industry forward to a greener, more profitable and more sustainable future. Color Hybrid is being built by Ulstein Verft, and designed by Fosen Yard. It accommodates 2,000 passengers and 500 cars.